Three sunflower arrangements (top) and their floret types (bottom). Wild sunflowers have typical outer ray and disc florets (left), double-flowered sunflowers have mostly ray-like mutant florets (middle), and tubular sunflowers grow only disc-like florets (right). The famous Dutch impressionist painter Vincent van Gogh was obsessed with sunflowers, until he died in 1890. His iconic paintings of sunflowers fetch millions of dollars at auction. Scientists have been trying to solve the genetic origin of the mutant teddy bear sunflowers that are depicted in van Gogh’s canvases. The family Asteraceae is the largest and most successful flowering plant family on Earth, states John Burke, a plant biologist at the University of Georgia. There are a lot of variations happening, which are largely due to changes in symmetry. The genes controlling this symmetry could be an important role in their evolutionary success. The researchers published their findings in the journal PLoS Genetics on March 29th. Sunflowers are also the source of crucial foods, but the large yellow tops aren’t single flowers. Instead, they form aggregates of hundreds or thousands of smaller flowers, named florets, which grow in two types. Ray florets are petal-life flowers that line the edge of the sunflower’s head and don’t develop seeds. Disc florets grow seeds and fill the center of sunflowers. There are other types of floret arrangements. Some sunflowers only grow ray-like florets, while others only have disc-like florets. An in-between type of floret is the teddy-bar floret, that’s a mix between the previously mentioned two, and are prized by ornamental sunflower growers. 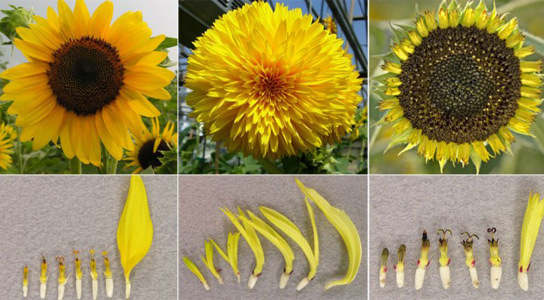 In this new study, Burke and his team cross-bred multiple varieties of sunflowers to trace any genes tied to the appearance of teddy-bear florets. Two different mutations to the gene HaCYC2C could be the reason of floret symmetry. However, they couldn’t determine the exact combination of mutated genes that led to the green-centered, double-flowered teddy bear sunflowers in van Gogh’s series of paintings. This leads the researchers to believe that these traits are transient, and may come and go depending on what kind of pollinators are attracted to the florets. 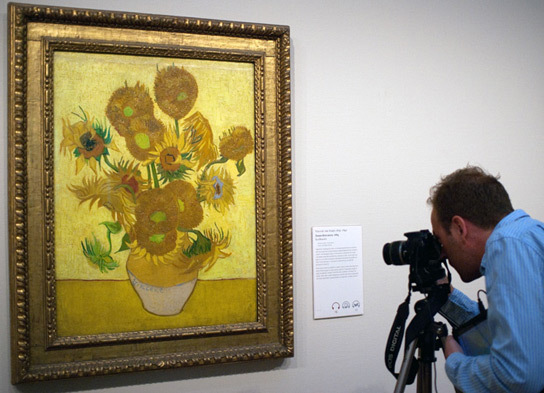 1 Comment on "Genetic Clues to Van Gogh’s Teddy Bear Sunflower Florets Uncovered"
Van Gogh was a Post-Impressionist.